In the afternoon we went on a walking wildlife safari in Manuel Antonio National Park. Just a few dozen feet past the entrance Gustavo stopped and trained his scope on a two-toed sloth high in a tree not far off the trail. The shaggy ball of fur blended in pretty well among the dark shadows of the tree branches and canopy, but we could see its face reasonably well. After that first spotting we learned a little about some of the palm trees nearby and saw a chestnut-backed antbird, but quickly went on as there were reports of monkeys up ahead. Tickets to Manuel Antonio National Park (L); the group learns about a couple of palm trees (LC); a two-toed sloth high in a tree (RC); and a chestnut-backed antbird (R). A troop of white-faced capuchins were putting on a show, climbing up onto a power pole to walk along the electric wires along the trail. We watched as a mother capuchin helped her two big babies get to the wires from a nearby tree and then carried them each in turn half way across the wire on her back until she stopped and had them run the rest of the way to the nearby tree on their own. We watched lots of the little animals jumping around in the trees, foraging for insects and fruits, eating a small green banana, and growling and baring their teeth at anyone who got too close. The group and other tourists watching the white faced capuchins (L), and the small monkeys traversing electric wires (LC), eating a green banana (RC), and growling and baring its teeth at people who got too close (R). As we continued on down the wide gravel road, we saw quite a few interesting black caterpillars with white markings, red head and legs, and long, white-tipped black filaments at the front and back ends. Some of them were crawling on the ground or plants, but many dangled from silken threads coming from high up in the trees. Kari spotted a black iguana, Jeff found a large leaf-footed bug, and there were many other interesting little things here and there. A cool caterpillar (L), black iguana (C), and a leaf-footed bug (R). When we got to the turnoff to the beach, there was a crowd of people staring up into the trees. 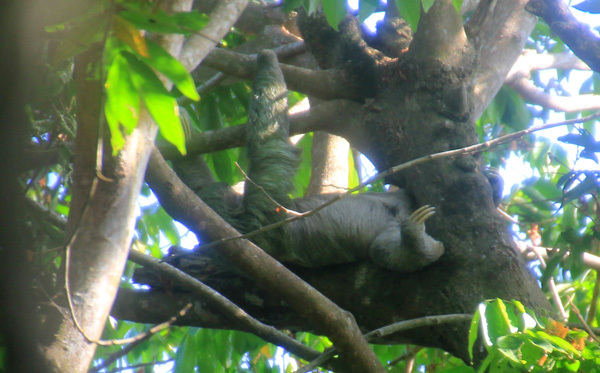 There was a three toed sloth lounging upside down on a branch, it’s face obscured by foliage, but the back leg with its huge claws distinctly visible, and the shaggy, greenish arms extended, holding onto a branch above. A three-toed sloth laying upside down on a tree branch. As we had been walking on the trail, there had been a steady stream of people in bathing suits returning from the beach, as it had been closed because of a crocodile. So we went down to look for it, and sure enough, the large reptile was pulled up on the sand off in the distance. Portable signs indicating the crocodile danger had been moved out onto the beach, and a couple of park rangers shooed the crowd back, and whistled if someone wasn’t paying attention to the closure – like a woman who went into the water (but very far down the beach from the croc). One of the five beaches at Manuel Antonio National Park (L); sign warning of crocodiles on the beach (C), and the 8 foot long croc on the sand (R). We moved on, with a few of us stopping to take video of a dense band of leafcutter ants hauling their green loads back to their nest. Dave came back to tell us there was a white-tailed deer up ahead. The small animal was browsing right on the roadside, and seemed unperturbed by the large number of people walking by and taking its picture. We watched it for a bit before it jumped back into the bushes and disappeared. As we continued the walk back we pause periodically to look at interesting plants (including the climbing fern Lygodium venusta, with lateral sori on many of the leaves), some pale vented pigeons sitting high in the leafless branches of a tall tree, and a few lizards along the way. White tailed deer browses unconcerned as people walk by (L and C); climbing fern Lygodium venusta (R). We left the park, boarded the bus, and as we climbed the winding hills back toward the hotel, Ricardo pulled off into a turnout as a troop of squirrel monkeys moved through the trees. We got out just in time to see the stragglers in the group jump from branch to branch, and then cross over the road on a thick cable, and disappear into the forest for a nice encore to our afternoon’s adventure in the Park.